How to manage your risk while trading? Exit a trade as soon as you recognize that it has gone wrong. Don’t try to manage the losses. Many floor traders believe the smartest trader is the first one out. Do the exact opposite when you are on the winning side of the trade. 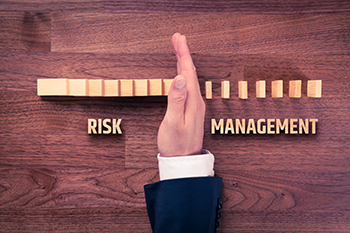 Risk control is as much about common sense as it is about complex rules and mathematics. Many successful traders managed to be on the winning side with the mere application of common sense techniques and not some complex formulas. 1) Risk only a small amount of the total capital on any one trade. No trader can maintain a winning streak forever, and hence it is advisable to invest a small amount of the total capital in each trade. This should allow you to comfortably tide over a number of losses in a row. Nothing ever goes as planned, and you must be prepared for infrequent but important exceptions, such as a price shock. You should not be under-capitalized at any stage and for this, you should not risk more than 5-6% of the capital invested in a particular trade. 2) Know your exit conditions in advance. Even before you begin trading, you should be absolutely clear on your exit criterion, even if the exact losses cannot be ascertained in advance. Be sure that your trading profile is compatible with your risk preferences. You cannot follow a strategy that takes risks that are uncomfortably large. Avoid trading in the futures and options segment if you do not have the appetite to digest a 15-20 % drop in capital within a few hours. Close your position if hard money, technical or time based stop loss is hit. 3) Exit a losing trade quickly. Exit a trade as soon as you recognize that it has gone wrong. Don’t try to manage the losses. Many floor traders believe the smartest trader is the first one out. Do the exact opposite when you are on the winning side of the trade. Do not wait till your margin call is hit. Experienced traders believe that a margin call is an objective statement of a trade that has gone wrong, or a system that is not meeting expectations. It is a time to review performance rather than invest more by meeting your margin call. Always remember that when you win, win big and when you lose, lose less by closing your position early . 4) Liquidate your worst position first when lightening up. History has taught us that outperformers tend to outperform so the profitable trades have proven that they are trending or performing properly; the losing ones have proved they are not. Stay with the good positions and liquidate the worst. 5) Be consistent with your trading philosophy. If you are a trend follower, then keep losses small and let your profits run. You cannot be a trend follower by taking profits whenever they occur, and holding on to your losses till your entire capital gets wiped out. 6) Holding on to cash. Market wisdom tells us that sitting on cash is also a position. Adverse markets demand a short-term zero-out trading approach that takes targeted exposure when opportunities show up and then returns to cash as soon as a conservative profit target is reached. 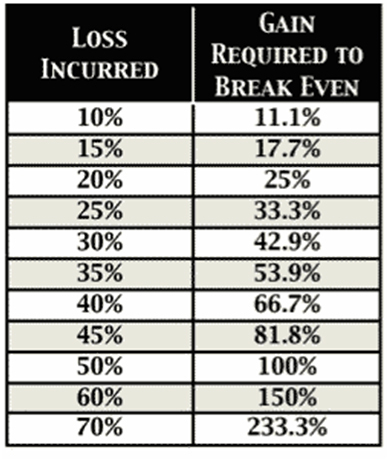 The above chart clearly shows that the law of percentages is against the investor/trader. A major loss always requires a larger gain to offset it. Hence we should maximise our gains and minimise our losses when the trade is in our favour.